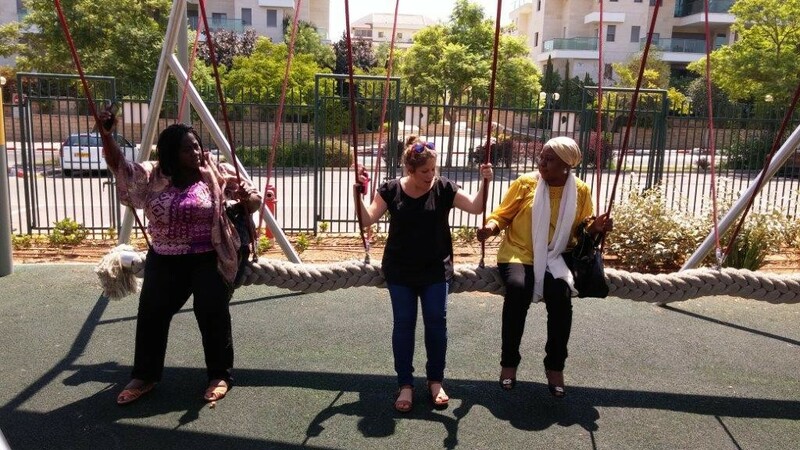 This July, two Nigerian representatives visited Israel to learn about Beit Issie Shapiro’s inclusive and accessible playground model, and explore a range of educational-therapeutic center models. Ms.Ayobisi Osuntusa, director of Sesame Square (Nigerian Sesame Street), and Ms. Fatima Hajju Tomsu Abdul Kadir, of the Ministry of Women’s Affairs in Nigeria (the office that is also responsible for children with disabilities in the country), were hosted by Beit Issie Shapiro on a 4-day study tour including visits to inclusive playgrounds and centers in different areas in Israel that were developed with the assistance of Beit Issie Shapiro, learning about the unique model that combines physical as well as social accessibility. The study tour equipped them with the tools to jump-start the process of establishing an inclusive therapeutic center and playground in the Nigerian capital. “I’ve learned from Beit Issie Shapiro, the importance of moving society from exclusion to inclusion. And the integration of all groups of children for the benefit of national development” said Ms Abdul Kadir. “I was so impressed to see how therapy, care and inclusion are applied on so many layers at Beit Issie Shapiro. Whether by looking holistically not only at the child with disability but also the parents, the siblings, the whole family and even the community. Or by finding ways to integrate a range of innovative and multi-disciplinary therapies, models and techniques. Or by incorporating the use of technology in many creative and functional ways. There is so much I will be taking back with me.” Ms. Osuntusa said. “We are always excited to share our knowledge and experience, especially when it fosters even greater global impact in the field of disabilities. We are proud to have opened this new professional collaboration with our Nigerian partners and we look forward to assisting them with creating better quality of life for children with disabilities in Nigeria” said Sharon Yeheskel-Oron, Beit Issie Shapiro’s International Collaborations Officer.